This review first appeared in the August 2010 issue of hi-end hifi magazine High Fidelity of Poland. You can also read this review of the Convergent Audio Technology SL1 Legend in its original Polish version. We publish its English translation in a mutual syndication arrangement with publisher Wojciech Pacula. As is customary for our own reviews, the writer's signature at review's end shows an e-mail address should you have questions or wish to send feedback. All images contained in this review are the property of High Fidelity or CAT - Ed. 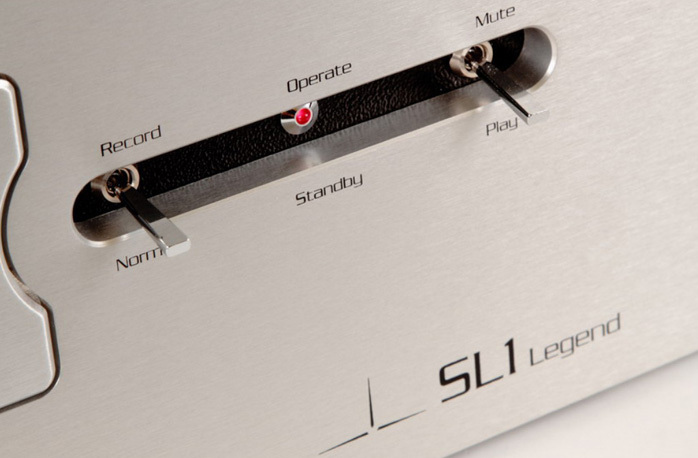 The SL1 preamplifier and its maker Convergent Audio Technology are some kind of phenomenon. You won't find CAT advertisements nor do they try to maximize sales or tempt you in any other ways. They don't even operate their own website. This company's MO is thus contrary to common rules of running an effective business in today’s contemporary (post) capitalistic world. CAT though has something in common with Spectral, another American company – a specific philosophy one might call soft power. Ken Stevens, owner of Convergent, assumes that what he does at any given moment is the best he can do. To maintain that quality he must supervise each stage of production, listen personally to each finished machine and assemble most of it personally. That clearly limits throughput. It also means he doesn't have to try to find buyers. Rather, they must wait on him to deliver and be very patient while at it. It’s a very interesting approach when most manufacturers hope to quickly transcend this business phase to grow into companies of Krell or ARC stature. I really appreciate those companies and admire many of their products but in my opinion the ultimate high-end must remain custom made in very limited quantities. ‘Custom’ implies that the designer himself imprints his personal touch on each and every device created. I'm quite certain about that. I observe it almost every day with Ancient Audio whose maker Mr. Waszczyszyn approaches things in exactly this manner too. The very foundation of such activities and business approach is product. While that’s fundamentally true for any producer of course, there’s still a huge different between product and product. In this context of ultimate creations, it implies something truly finished, something which can perhaps be slightly polished over time but not really improved. Its core character won’t change even with minor advances. That's the SL1. It's a product Ken Stevens first introduced to market some 26 years ago. While there were a few small changes and minor updates, they were mostly ‘cosmetic’ in nature and nothing substantial. To keep it simple, he added Reference, Renaissance or Legend to the model name but the primary designation never changed. Officially there never was a Mk II suffix. The various names were only applied for internal use to make it easier to distinguish one version from another. To be clear, anyone who reviewed different versions of the SL1 claimed that the newest version sounded better, that some sonic aspects had been improved—which only proves that Stevens worked really hard to improve what had been almost perfect already—but they also all claimed that the general character of the SL1's sound hadn’t been altered. Recordings used during listening sessions: HiQualityCD. Jazz Selection, EMI Music Japan, TOCJ-90010, HQCD + CD; Musik wie von einem anderen Stern, Manger Products, MANG-2010, 2 x 180g LP; Ben Heit Quartet, Magnetism, Acousence Records, ACO80108, 24/192, FLAC; Billie Holliday, Songs For Distingue Lovers, Verve/Classic Records, One-sided, 2 x 180g, 45 rpm LP; Buck Clayton, How Hi The Fi, Columbia/Pure Pleasure, PPAN CL567, 2 x 180 g LP; Clifford Brown and Max Roach, Study In Brown, EmArcy/Universal Music Japan, UCJU-9072, 180g LP (mono); Depeche Mode, Fragile Tension/Hole to Feed, Mute Records, 12BONG42, 2 x 180g, maxi-SP LP; Depeche Mode, World in My Eyes/Happiest Girl/Sea of Sin, Mute/Sire, 21735, maxi-single LP. ; Don Friedman Trio, Circle Waltz, Riverside/JVC, VICJ-60258, XRCD²; Frank Sinatra, Sinatra & Strings, Warner Music/Mobile Fidelity, MFSL 1-313, No. 199, 180g LP; Jim Hall, Live!, Horizon/A&M Records/Universal Music Japan, UCCM-9225, CD; John Coltrane, Giant Steps, Atlantic/Rhino, R1 512581, 2 x 45 rpm LP; John Coltrane, The John Coltrane Plays, Impulse, IMP 12142, CD; Julie London, Julie is her name. Vol.1, Liberty, LRP 3006, LP; King Crimson In The Court Of The Crimson King, Discipline/Universal Music Japan, UICE-9051, HDCD; Kraftwerk, Tour The France Soundtracks, EMI Records, 591 708 1, 2 x 180g, LP; Laurie Anderson, Homeland, Nonesuch, 524055-2, CD+DVD; Lionel Richie, Can’t Slow Down [DeLuxe Edition], Motown/Universal, 181202, 2 x CD; Marty Paich, I Get a Boot Out of You!, Warner Bros./Warner Music Japan, WPCR-13187, SHM-CD; Michael Jackson, Thriller. 25th Anniversary, Epic/Sony Music Japan, EICP-963-4, CD+DVD; Perry Como, Como Sings, RCA/BMG Japan, BVCJ-37258, K2 CD; Robert Plant & Alison Krauss, Raising Sand, Rounder, 478020, 24/96, FLAC; Tori Amos, Abnormally Attracted To Sin, Universal Republic Records, B0012906-01, 2 x 180g LP.